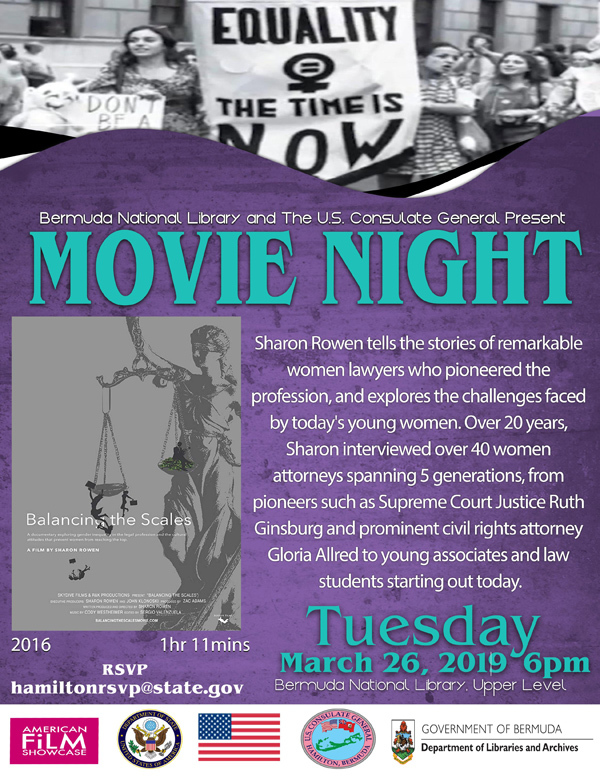 The U.S. Consulate and the Bermuda National Library will premiere Balancing the Scales to celebrate Women’s History Month on Tuesday, March 26 at 6:00 p.m. at the National Library. The feature documentary created by lawyer and filmmaker Sharon Rowen, explores the history of women lawyers in the U.S. and cultural issues that they continue to face. A spokesperson said, “In this groundbreaking film, Sharon Rowen interviews five generations of women attorneys including Supreme Court Justice Ruth Bader Ginsburg, well known civil rights activist Gloria Allerd and Roe v. Wade attorney Margie Pitts Hames about their own remarkable stories and the challenges faced by women lawyers in the United States today. “The film was shown nationwide on U.S. public television stations in 2017 and has been screened to support discussions about gender equality with some of the world’s largest law firms and corporations as well as national bar associations and national women’s organizations, including the ABA/Harvard Summit on Retaining Women in the Profession and the National Association of Women Lawyers. “Rowen received her Bachelor’s from Emory University and earned her law degree from Columbia Southern College of Law. She is a founding partner of law firm Rowen & Klonoski and film production company R&K Productions, both based in Atlanta. “Balancing the Scales is part of the American Film Showcase [AFS] which brings award-winning contemporary American documentaries, independent fiction films to audiences around the world. The Consulate was granted this collection of films which offers a view of American society and culture as seen by independent filmmakers. “Funded by the State Department’s Bureau of Educational and Cultural Affairs and produced by the USC School of Cinematic Arts [SCA], the Showcase highlights the value of film in fostering understanding and cooperation, dialogue and debate.